When the US Army issued the requirement for an Advanced Aerial Fire Support System, Lockheed won the contract with an advanced design - the AH-56A Cheyenne. The Cheyenne was a rigid rotor aircraft that employed fixed wings to augment lift in forward flight and a pusher propeller that further augmented forward thrust. The combination was to give the aircraft a 212 knot dash capability and an impressive array of range and firepower. A fatal crash of one of the prototypes, delays in the development schedule, and the general political climate of the day led to the cancellation of the production contract, followed shortly thereafter with the cancellation of the overall program. The Army regrouped and issued requirements for a more conventional attack helicopter, and that competition led to the current AH-64 Apache. The Cheyenne was indeed an advanced design. Its main rotor could still function like any other helicopter, but it didn't require the aircraft pitch changes to accelerate and decelerate, thanks to the pusher propeller. The pusher had full pitch control so it could adjusted for different levels of forward thrust, reverse thrust (for rapid deceleration) and in beta for normal deceleration, all without moving the nose off target. The aircraft was armed with a 20mm cannon in a ventral turret, additional firepower in the nose turret, an array of rockets, missiles, and external fuel tanks under its wings. Unlike many attack helicopters, the Cheyenne also featured retractable landing gear to further reduce drag. Strange and wondrous things arrive at the in-box of Cybermodeler and here was one of the bigger surprises. Reader Klaus Lehmann sent in this Aurora 1/72 AH-56A Cheyenne for us to compare with the recent Anigrand Craftswork kit. What is surprising is that anyone that has wanted one of these gems knows that they command a hefty price on the collectors' market. If you're reading this Klaus, vielen Dank! Molded in tan styrene, this kit was designed as a quick build which was ideal for younger modelers. As you can see in the photos to the right, the kit is simple in layout. Having spent some time with the Anigrand kit and lots of photos of the several prototypes on display, I had come to the conclusion that it would be far too much work to fix that kit. You can read that review here. So when Klaus sent this kit along, it was worth doing a comparative look. 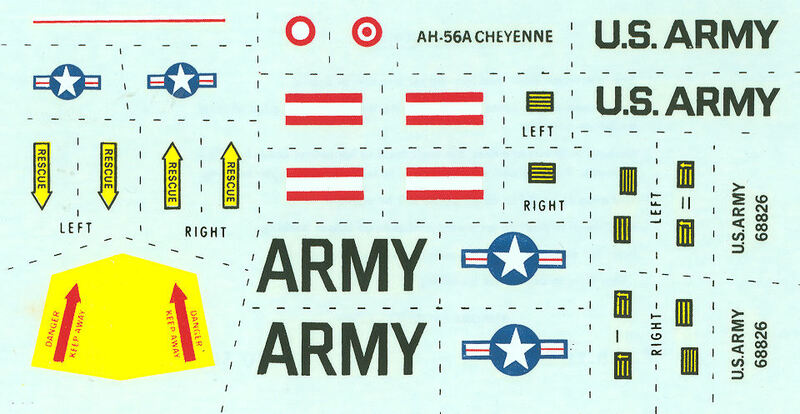 The kit provides markings for the prototype aircraft 66-8826. So if you're wondering if the Aurora kit was more accurate than the Anigrand offering, it is probably a safe bet that the Anigrand kit is based upon an Aurora kit. Can you accurize either kit? You bet. The Aurora kit will be easier to modify as a styrene kit, but a skilled modeler could also apply the same updates to the Anigrand kit. If you do elect to modify either kit, the best thing to do is create several vacuformed canopies out of an Aurora canopy and go from there.